It’s an inarguable fact: cleaning the bathroom is not a joy. The joy comes afterwards, knowing that you now have a clean bathroom. But it is certainly not a pleasurable experience in the sense that you look forward to doing it for its own sake. 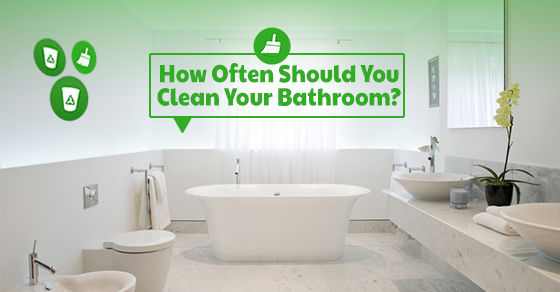 The question arises: how often should you clean your bathroom? Cleaning every day obviously implies that you will have a consistently sparkling bathroom, which is idea, but unless you are set on doing chores all day every day, inevitably, other areas will get left out. Cleaning once a week, although still considered “regular” cleaning, means that some dirt and grime will build up. Below are 5 reasons why you should clean your bathroom at least every week. It goes without saying what happens in the bathroom. As such, it is a breeding ground for germs and bacteria. These can spread throughout your house and increase the odds of someone getting ill.
One of the biggest fears people have when entertaining is that their bathroom cleanliness will not live up to their guests’ standards. A dirty bathroom says a lot about it’s owner and their tolerance for grime and bacteria. Again, we can file this under “goes without saying,” but even still, some people wait far too long to address the issue of a smelly toilet. Clean your toilet at least once a week to make sure that it is both sanitary and that it is not the source of unpleasant odours in both your bathroom and the surrounding area. It is an accepted fact that when you flush the toilet, you are inevitably spreading small, imperceptible particles around the washroom and contaminating whatever they touch. The sink, the shower, toothbrushes, this contamination builds up over time. If you let too much time go by, the contamination will start to not only become noticeable, but a health hazard. Even if you can’t see it right now, clean it! If you live with multiple people, the amount of water that the bathroom gets exposed too is staggering. All of the showers, hand washing and toilet use adds up to the perfect environment for moisture-loving mould and mildew to thrive. Making sure that you are controlling this environment on a weekly basis so that mould and mildew doesn’t have the ability to thrive will ensure your bathroom doesn’t begin to look like a dirty fish tank. There is a healthy amount of dedication to cleaning and overkill. With the bathroom, it’s better to err on the side of caution than of nonchalance. If you don’t have time to dedicate towards keeping your bathroom clean, contact the Sunrise-Cleaning team today! We’ll ensure that your bathroom is always in top condition to keep your family healthy and your guests happy.